For the believing Jew today, no less than for those in the past, the study of the weekly portion is a religious experience. For this reason it is customary to consider the section along with its traditional commentaries. It is important to know not only what the Torah meant when it was written, but also what it has meant within Judaism since then. It is also important for intellectual honesty to distinguish between the two. Moderns also have the advantage of using the results of linguistic studies and comparative studies of other ancient texts as well as archaeological finds to help us understand the text. The Torah reflects an entire worldview concerning the nature of God and of human beings, the task of Israel and the way in which we are to live. Thus it is an ancient text that is ever new and always renewing itself. One studies it not only to learn what was, but also to discover what we are and how we are to live. These prefaces are meant to complement and enrich your study of the portion by pointing out important ideas found therein and raising problems and questions for consideration. 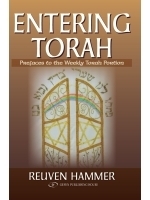 Enter into the Torah text with this lively companion and experience the full impact of the age-old – and totally new – weekly portion. A veritable thesaurus of ideas and insights based on the weekly Torah portions, all of which are relevant to us today. This is must reading for all who wish to taste and learn from the wellsprings of our Book of Books and to become immersed in the wisdom of ages. A valuable resource for individual reading as well as study groups... I recommend it with enthusiasm.